Released on June 29th 2016, ‘Watford Mishmash – The History of Watford Football Club in One Image’. 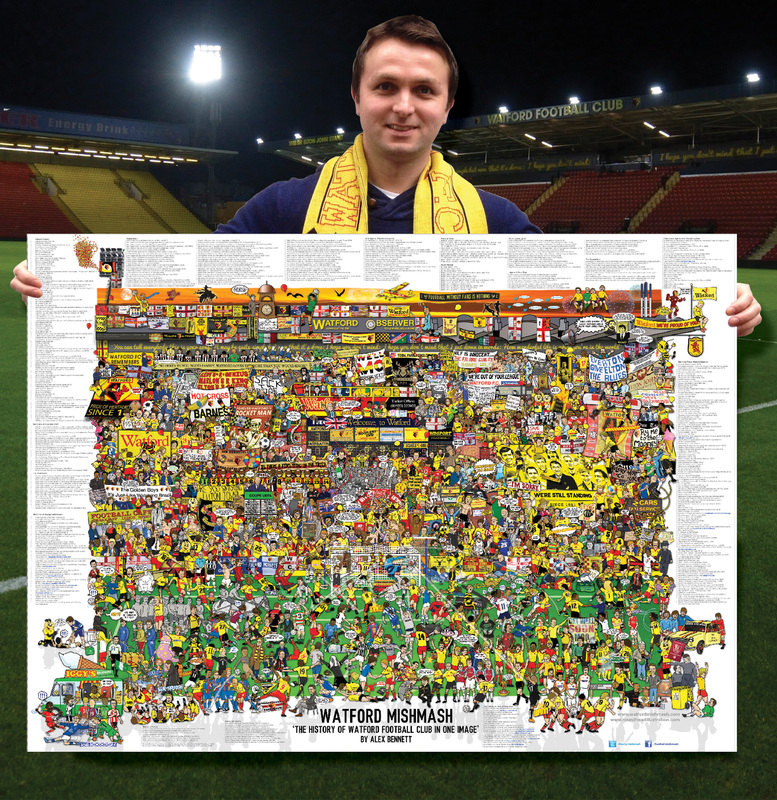 Since beginning Watford Mishmash in July 2015, I estimate that I have spent over 1000 hours creating this image… the things you do for your club! Your Watford Mishmash poster is 69cm (height) x 99cm (width) and is printed on 170g high quality paper with a gloss finish. Click on the image above to see the Making of Watford Mishmash in 6 seconds. Each print will be hand signed by it’s creator Alex Bennett in the bottom right hand corner. A checklist of everything that has been included within the illustration fills the border. 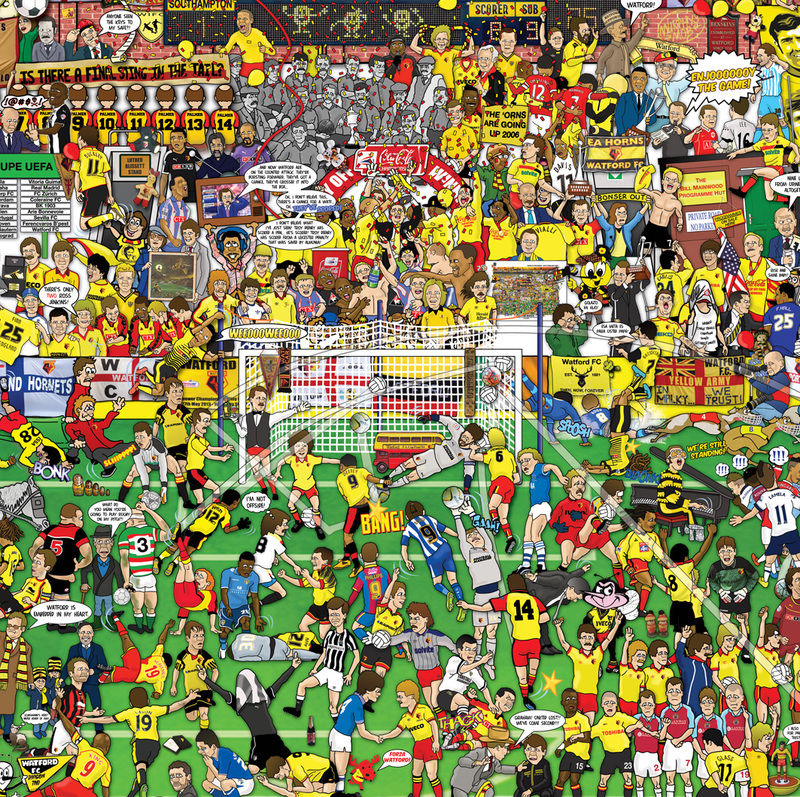 ‘Watford Mishmash’ has been produced with permission of Watford Football Club. A percentage of each sale will be donated to the Peace Hospice. This #teamishmash turned out great! I think you should next do a #teamishmash of Real Madrid, which would include the 10 UEFA champs trophy liftings, the Galacticos (I and II),Zidane’s volley, H.Sanchez’s bicycle, and S.Ramos’ La Decima header. Hi, yes a Real Madrid Mishmash would be great! I am in contact with a few other clubs so watch this space! Many thanks! Just seen the finished work. It’s truly exceptional. After 40 years of watching Watford, it almost brought me to tears! Just seen this promoted in the Wobby … never thought I’d start my Christmas wish-list in June! Fantastic; the pictures are amazing. So much to look at, will be looking at the picture for ages, and then some. Absolutely love it. Got it for my son who’s an avid fan.. Absolutely superb! From “Wolfie” the programme seller to “that” Deeney goal and everything in between, before and after. I can’t think of a singular historic, important, funny or just plain crazy moment that hasn’t been captured and recorded in the mishmash. All this as well as all the famous banners and supporters groups’ flags, this is Watford through and through. I feel so sorry for my young kids. Their story time is now based around me explaining all the parts of this fantastic piece. Alex has missed nothing out and it is just an outstanding effort that I recommend to every Watford fan. Yesterday I discovered that I’m in the new ‘History Of Watford Football Club In One Image’. 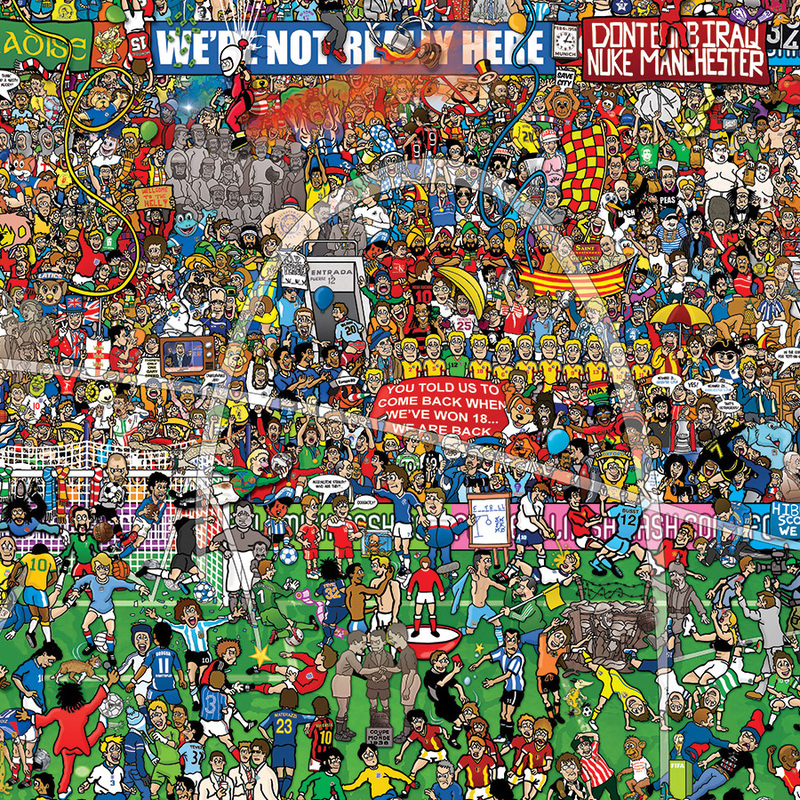 I’m sitting on the left-hand side of the massive illustration by the corner flag. I’m sandwiched by David Holdsworth (1991-3 shirt) and Rod Thomas (1988/9). The point is what I represent in this image. I represent you. The fan. In Watford’s history. Why’s that important? Because, over 135 years, Watford would have been nothing without its fans. The banners behind me, and at the top of the image, illustrate the same point. 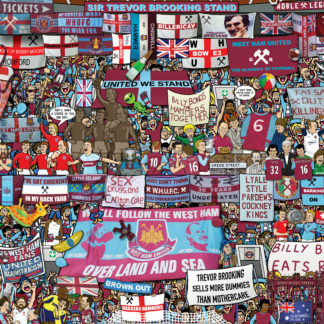 The club and its community have travelled together through all the fantastic moments depicted. The banners, especially, prove another point. Fans contribute to the spectacle. (The 1881 took this to a new level last year.) A football match simply wouldn’t be the same if the fans weren’t there. But the idea that I am you in Alex Bennett’s incredible work shows what a wonderful creation it really is. When you study the image and recognise the hundreds of references, they’re actually your references. Your memories. It’s a history of you as a Watford fan. A history of you in one image. It has taken 11 months of hard work through the night, drawing images of the likes of Kenny Jackett and Pierre Issa on a stretcher, but the completion of the Watford Mishmash has made it all worthwhile. Lifelong Hornets fan Alex Bennett started the design last summer and has put the finishing touches to the poster, which is the history of Watford Football Club in one image. 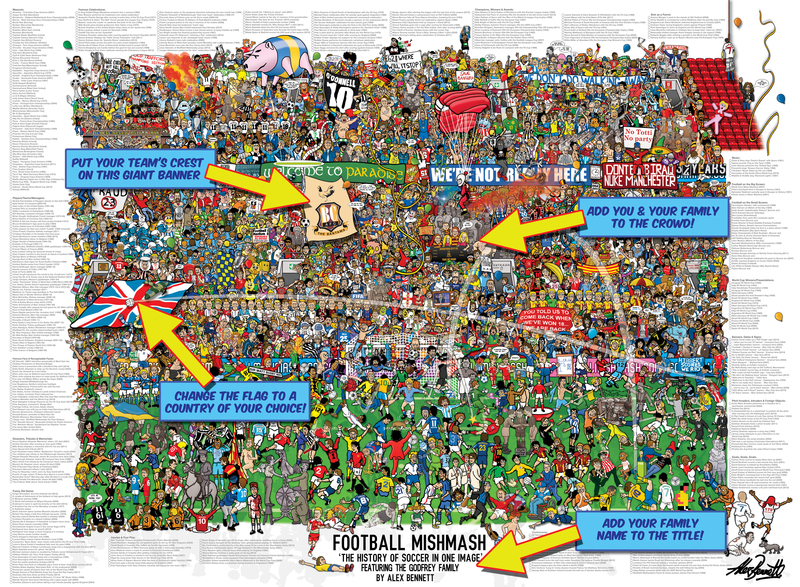 Bennett came up with the Football Mishmash concept, which was finished in 2013. It was the history of the sport in one image. A wrestling Mishmash and rugby Mishmash followed and the logical next step was a version for the club he supports. The illustrator has contributed regularly to the Hornets’ matchday programme and needed no persuading to design a Watford Mishmash. Bennett said: “I always knew I was probably going to end up doing it. It was just a matter of finding the time to do it because it’s quite unusual work, not getting paid for it until the end. Bennett has endeavoured to cover as much of Watford’s history as possible and has gone right back to the origins of the club using a variety of sources for the material included in the Mishmash. Bennett added: “It’s a lot from memory [research] and I’m quite active on Twitter so I threw open questions to Watford fans about images of certain days. “I looked through old programmes and whatever source I could find. YouTube is good as well for that. Being the creator of the Watford Mishmash has its perks and Bennett managed to sneak an image of his son into the design. But aside from this personal touch there are a range of quirky moments featured such as Issa being dropped on a stretcher and Juan Carlos Paredes throwing the ball in Daley Blind’s face last season. Bennett, who has been going to Watford games for almost 30 years, since the age of six, said: “I’ve included me taking my son to his first game a couple of years ago which is not exactly a historical moment for everyone else but hopefully he’ll appreciate that in a few years and will make sure he doesn’t end up supporting Manchester United. Every character is hand drawn and inked initially. Fitting all the detail onto the 69cm by 99cm print was no easy task. The football Mishmash is currently a massive mural in the Vicarage Road Stand and the Watford version is expected to be on display in the Rookery and Graham Taylor Stand next season. Great for any Watford supporter ?? Many thanks for your feedback & continued support Christine! I’ll hopefully get round to doing a Everton version soon!